The United States Congress designated The Brothers Wilderness (map) in 1984 and it now has a total of 16,297 acres. All of this wilderness is located in Washington and is managed by the Forest Service. The Brothers Wilderness is bordered by the Daniel J. Evans Wilderness to the west and the Buckhorn Wilderness to the north. The Brothers Wilderness is located on the eastern flanks of the Olympic National Forest just South of Buckhorn Wilderness and north of Mt. 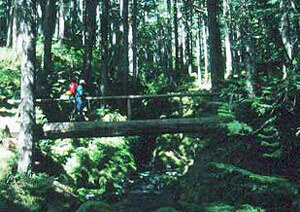 Skokomish Wilderness. Between moss- and fern-laden banks, the Dosewallips and Hamma Hamma Rivers run cold and clear north and south, respectively, of the borders of The Brothers Wilderness. At 6,866 feet, The Brothers is the highest peak in the area, with a distinct double summit that ranks among the most popular climbs in the Olympics. Through the center of the Wilderness the Duckabush River splashes down a wide and lovely glacier-carved valley shadowed by tall hemlock, fir, and cedar. From the Duckabush the terrain rises steeply into a mazelike network of forested ridges that peak on The Brothers to the south and 5,701-foot Mount Jupiter to the north. In the rain shadow of the Olympic Mountains, the area collects about 80 inches of precipitation each year, and temperatures stay temperate, rarely rising above 80 degrees Fahrenheit and seldom freezing along the river. The higher elevations get their fair share of snow. Planning to Visit The Brothers Wilderness? How to follow the seven standard Leave No Trace principles differs in different parts of the country (desert vs. Rocky Mountains). Click on any of the principles listed below to learn more about how they apply in The Brothers Wilderness.